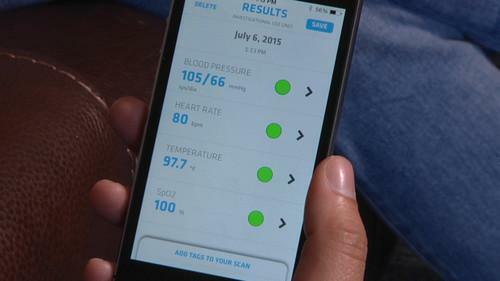 Results from the Scanadu Scout sensor, seen on a cellphone screen during a demonstration at the company's office in Moffett Field, California, on July 6, 2015. The handheld device is being promoted as a tricorder -- a realization of the fictional scanning device made famous by the TV show and movies -- and Scanadu's founder, Belgian inventor Walter De Brouwer, says that's where he got his inspiration. "I'm a baby boomer, so we looked at 'Star Trek' as a business plan, not as a movie," he said. From Bones through Crusher to Voyager's Emergency Medical Hologram, a wave of the tricorder was all that was needed to diagnose a medical problem. So how does the Scout live up to its fictional predecessors? It's not quite as complex or futuristic, but it will deliver readings for heart rate, core body temperature, blood oxygenation, blood pressure and respiratory rate data in a fast, painless manner. The Scout is held up to the user's temple and takes about 30 seconds to produce its readings. It has a temperature sensor, and an optical sensor that shines red and infrared light through the skin to measure oxygen saturation and blood flow. The person being scanned must sit still and refrain from talking for the Scout to get an accurate measurement, but that's the only requirement. There are no additional probes, sensors or gadgets required to get the basic set of readings commonly monitored in hospitals. The results are sent via Bluetooth to a smartphone app, which presents them in an easy to read form. They are even color-coded to show you how close you are to a "normal" range. "Basically, you have the same power as a complete emergency room, but at your finger tips," said De Brouwer. As development work continues, De Brouwer said the scanning time and accuracy are coming down through the use of better quality sensors and better optics. Part of the work is taking place with early adopters, several thousand of whom helped fund development through Indiegogo. This early user base is helping speed along development. "In a normal medical company in the 20th century, this would have taken 10 years," he said. "We can now do it in 1 year." Data from the test is being used as part of Scanadu's application with the U.S. Food and Drug Administration for approval as a medical device. If it gets approved, that opens it up to wider use in hospitals. De Brouwer hopes that will happen soon enough to start selling the device some time in 2016. He's targeting an initial price of $199. The company already has a second product in development. The Scanadu Urine is a device for home urine tests that monitors protein, white blood cells, nitrites and other particles present. The piece of plastic contains an array of small, chemically reactive pads on a small piece of plastic that change color depending on the characteristics of the urine. After about a minute of reaction time, you snap a picture of it with the Scanadu app and it deduces its measurements from the different color hues. Alongside the reactive pads on the plastic strip are several color references to help with correct readings. "In the future, I think our hospitals will be full of mobile devices," said De Brouwer, "and people will have real conversations with their doctors about real medical things because they will know a lot more than they do now."